Sometimes all you have to do is rev up a blender and let that most versatile of kitchen power tools take over. Whether you want something sweet or savory, you can toss some ingredients into a blender and end up with a liquid dinner. This multi-colored, multi-layered, multi-faceted dish will impress at any dinner party you’ve got. You probably never thought to take your caprese salad through a blender before. Let us show you how. 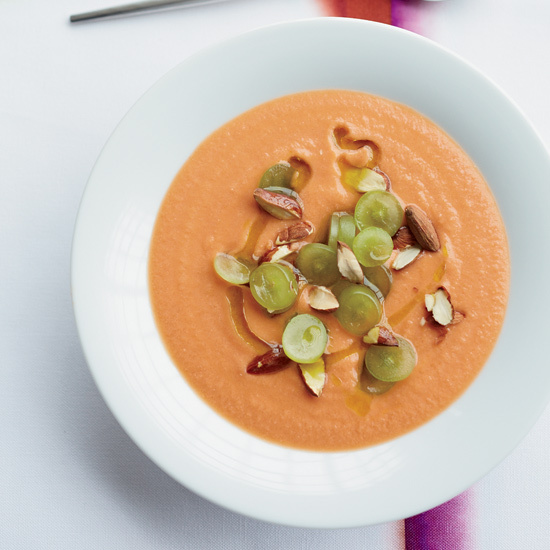 This lightly sweet soup pairs honeydew and cantaloupe. Just be careful not to mix the two sides. You don’t want your Yin Yang to bleed together. Gazpacho has been done. It’s time to change things up a little with this smokier, creamier option. No list of blender meals would be complete without a healthy smoothie for breakfast. But we want to give you something you won’t find at any Jamba Juice. This mango smoothie is slightly tart thanks to unsweetened tamarind paste.